What is a Puzzle Toy for Dogs? Puzzle toys are a fast and efficient way to catch and hold your dog's attention for hours of challenging play. These types of toys come specially designed to keep your dog occupied and exercising when you're not around to play or engage with them yourself. Since there are hundreds of different puzzle toys available to choose from, we rounded up the top five best dog puzzle toys available on Amazon. Before this, we picked out criteria to form a buyer's guide because we want you to feel comfortable and confident when you start shopping for the dog's new toy. A dog puzzle toy is a toy that comes with some kind of puzzle built in that encourages your dog to move it around to manipulate it in some way in order to get a reward. These puzzle toys are meant to serve as a distraction to your dog to keep them entertained when you're not around to entertain or interact with them. These types of toys are popular with dog parents who have dogs who don't do well on their own or who start to display destructive behaviors like chewing on furniture or shredding fabric. They're designed to help relieve any anxiety or stress your dog has by keeping them mentally stimulated. There are several great benefits that come with giving your dog puzzle toys. We've picked up the top benefits and laid them out for you below. One of the biggest benefits of this type of toy is that it challenges your dog on both a mental and physical level to work to get the food or treats out of the toy. This is particularly useful when you have a rambunctious puppy who wants to be doing something every second that they're awake. Having the toy around gives your dog something to focus their attention on and distract them from the fact that you're not directly by them to pay attention to them. This can also help to encourage problem-solving skills and development. If you live somewhere where it gets very hot or very cold, you may not want to take your dog out to exercise as much as you normally would. This can lead to weight management problems and weight gain if you continue to feed your dog the same amount while their exercise levels decrease. These puzzle toys encourage your dog to get up and move the toy around in order to get the reward. When you combine this by restricting the amount of food you feed them to match their decrease activity levels, you get an great way for them to exercise indoors and maintain a healthy weight. Destructive or unwanted behaviors are behaviors that your dog participates in as a result of things like boredom, anxiety, stress, and for attention. This is common with breeds whose owners don't have enough time to spend with them each day wearing them out both mentally and physically. A puzzle toy is a effective and safe way to divert your dog's attention from these unwanted behaviors and to distract them from the fact that you're not around. They encourage your dog to focus their behaviors on the puzzle instead of on your furniture or items. One of the first things you'll notice about puzzle toys is that there are several different types available. Picking one or two is a great way to narrow your choices down right from the beginning of your search so it won't seem so overwhelming. Comfort Toys - Comfort toys are designed to allow your dog to cuddle with them because they're usually plush, soft, and stuffed. However, these toys won't be able to hold up against hard play. Distraction Toys - When you don't have time to play directly with your dog, a distraction toy can help to keep them occupied. These types of toys are usually food or treat delivery toys, hard rubber toys with multiple pockets, or rope toys. Interactive Toys - Interactive toys are toys that require both you and your dog to play at the same time. Things like toys you throw for your dog to fetch or certain rope toys that allow you to play tug of war are good examples. There are several different things that you want to keep in mind when you're shopping for your dog's new puzzle toys. The following considerations will help to ensure that you get a safe toy for your dog to play with. Although puzzle toys are relatively inexpensive, you do want to make sure that you get a toy that is going to last for at least a few weeks or months without breaking and falling apart. Double check the toy's durability, see if the manufacturer has a guarantee, and don't be afraid to check product reviews for more information. 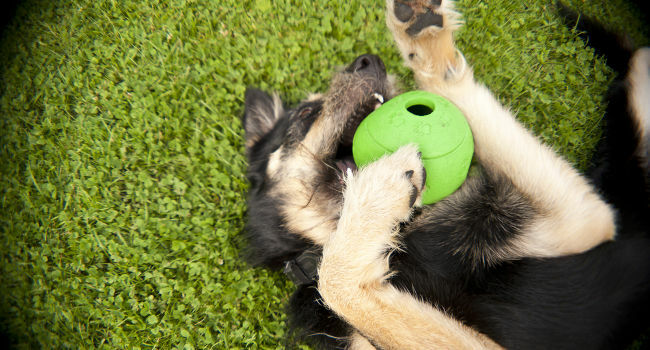 Your dog toy's material will depend on the type of dog you have. You can get toys that come made out of hard plastic, rubber, or other materials that are built to withstand chewing or rough play. If you think that this will put your dog off, you could try a toy with a softer and more plush material. Since safety is such a driving point when you give your dog a new toy, you want to ensure that it comes made out of safe materials. Look for dog toys that are BPA-free, non-toxic, free of dyes, heavy metals, chemicals, and other products. Also, check for previous recalls with the manufacturer. These puzzle toys come in several different shapes and sizes that allows you to get a good fit that helps it match your dog's size and weight. You want to find a toy that is large enough for your dog to interact with without being too heavy for them to move around or manipulate as they play with it. 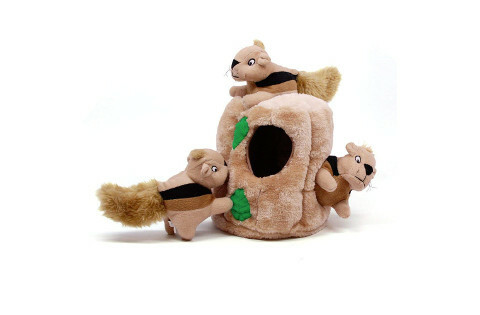 This soft and plush puzzle toy works to keep your dog mentally and physically stimulated as they try to figure out how to get the squirrels out through the trunk's holes. Each toy comes with one large squeaker inside of it to encourage your dog to sniff them out and find the squeaker. This toy also made our list of the Top 10 Dog Toys for 2019. This puzzle game also doubles as a fast and easy way for you to play fetch with your dog because the squirrels come with enough weight to throw them long or short distances. You get the choice of four different sizes ranging from small up to large with different squirrel amounts and sizes. Along with the three or six squirrels you get when you order it, Outward Hound offers additional packs of different animals that you can add to the original collection. The base of the toy also comes with hidden squeakers that can give your dog an additional challenge when they try to find them. Dog parents who bought this puzzle toy for their dogs were happy that it came with so many hidden squeakers in the trunk and in the toys to keep their dogs engaged. They did point out that neither the trunk or the toys would withstand aggressive chewing. 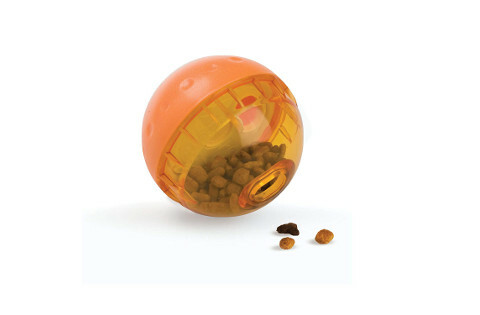 This treat ball is a fun an interactive way for your dog to figure out how to roll it so their treats or food falls out. The clear plastic features two levels that are separated by a plastic divider with a small hole that the treats will fall through. You can choose from two different sizes, an individual pack, or a pack of two in order to build your order to match your dog's needs. The ball twists apart in the middle to give you two equal halves that allow you to fill or clean it quickly and easily. The bright coloring on this toy makes it very difficult for your dog to misplace or lose this toy when they use it. Also, this toy works well with both smaller treats or smaller pieces of kibble because larger pieces can get stuck at multiple points. Dog parents who purchased this product liked that it was very simple to put together and to take apart to clean. They did say that it doesn't work well with larger kibble, kibble that crumbles, or anything but dry pieces. This puzzle toy harnesses the power of positive reinforcement to help train your dog to work switches and levers in order to get to the hidden treats or pieces of food. There are six different possible styles combined with three different training levels that allows this toy to grow with your dog. Once you hide the treats or food in this toy, your dog will have to flip switches or pull levels to release the door and lift straight up in order to get it. It does take a small learning curve for your dog to master it, but the lure of food or treats is usually enough to keep them entertained. The toy is a good size for dog breeds both large and small to play with without worrying about it being too heavy or difficult for them to operate. The base of this toy features a durable rubber ring that helps to hold the toy in place as your dog plays with it. It also provides a buffer, so it doesn't scratch your flooring. 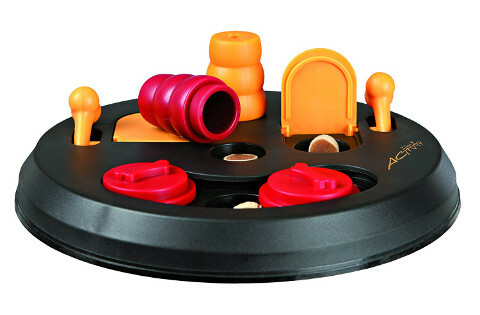 Dog parents who bought this puzzle toy liked that it came with so many different compartments and activities to keep their dogs entertained. Dog parents who bought this particular toy did say that it does take a while for their dogs to understand that there's a reward if they figure out how to open it. This brightly colored dog toy will dispense treats as your dog plays with it and learns how to move it to get the most treats out. Designed for aggressive chewers, this dog toy comes in a larger size and a smaller size that allows you to pick the one that fits your dog the best. The durable plastic outer later comes with a large compartment that is capable of holding several treats at one time. West Paw guarantees this product 100-percent against damage or breaking due to aggressive chewing because they're confident that this puzzle toy can withstand it. The slightly curved design combined with the three larger points on each end make this dog toy easy for your dog to carry, grip, and toss around as they try to get the treats out. The plastic is BPA-free, non-toxic, compliant with FDA regulations, and free of phthalate for a safer toy alternative. People who bought this puzzle toy for their dogs were happy that it comes with a guarantee against damage due to aggressive chewing or rough play. However, people did comment that this toy tends to fail or crack where you put the treats in with extended use. PetSafe's mushroom dog toy is an easy way to slow down how quickly your dog eats, stimulates their mind, and allows your dog to exercise while they eat all in one puzzle toy. You can choose from two different size categories that helps you find a good fit that isn't too heavy for your dog. Once you load your dog's food or treats, they'll have to roll it around in order to encourage the pieces to come out where they can get them. The toy comes apart quickly and easily when you want to clean it or reload it. You can pop it into the top level of your dishwasher for periodic cleaning. Each puzzle toy purchase comes with full customer support that is based out of the United States. The toy comes made out of non-toxic materials that are free of BPA for a safer experience for your dog to interact with and chew on. Dog parents who bought this toy liked that the larger top portion helps to offset the bottom portion so the toy wobbles and moves around. Dog parents mentioned that this toy may be too large for very small dog breeds to comfortably maneuver around. Our pick for the best puzzle toy for dogs is the Outward Hound Hide-A-Squirrel Puzzle Plush Squeaking Toy because it's a fun puzzle toy that has multiple ways to use it. You get squeakers in the toys themselves as well as hidden ones in the trunk to encourage your dog to continue playing with it. We liked that this toy comes with several slightly weighted plush animals that you can toss both far and near distances to play fetch with your dog. You can quickly and easily buy additional plushies, and we liked that it came in several different sizes and styles.